Camelback Village Racquet & Health Club was the site of the 2007 Arizona Club Championships May 19-20. Teams from Ahwatukee/All About Tennis, Life Time Fitness and The Village Racquet & Health Club were set to battle it out to determine a champion. After two days of exciting tennis and great match ups, Ahwatukee/All About Tennis defeated last year's champs, Life Time Fitness to take the trophy home. 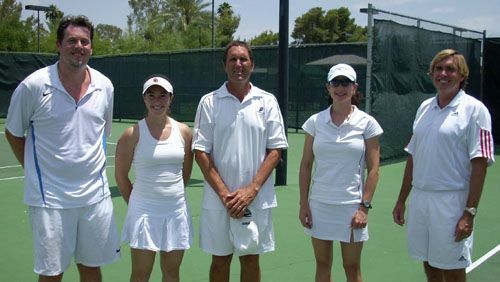 For information to participate in this team event, conatct the USTA Central Arizona office at 480-951-4333.